Congratulations to Lance Walker for his T2nd place in the STPGA Junior Tour Spring Series Championship. Lance is making steady progress with his game and he shot his career tournament low round of 73 in the first round! With his focus now on playing college golf, Lance is working hard on his game and improvements are showing in all areas. Congratulations to Mabrie and Eston! Congratulations to Mabrie McMahan for her 10 shot victory in the AIPL 5/6 Division Girls Tournament at the Harvey Penick GC in Austin. Mabrie has been working hard on her game and is making steady improvement in all areas. 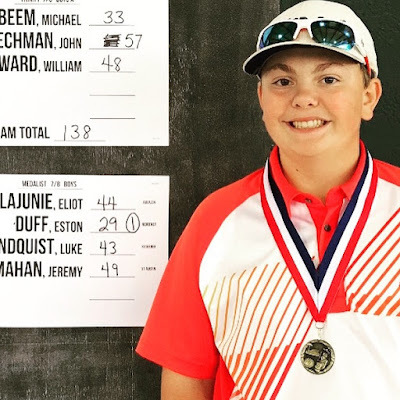 Congratulations is also in order for Eston Duff as he won the AIPL 7/8 Division Boys Tournament with a one under par score. Eston has also been doing well on the US Kids Tour and has just started competing on the Texas Junior Golf Tour. This is 9 year old Aiden Moore and he was having balance issues in his golf swing. In particular, he was allowing his left foot to spin out causing him to fall forward to his toes after impact. To help eliminate this issue, I teed up a golf ball just outside his left foot. In addition I placed an alignment rod just outside his toes. Aiden was to imagine he was standing near the edge of a swimming pool and the rod was the edge. In this drill, he used a 7 iron and the goal was to make a swing and avoid bumping the ball off the tee by his foot and not take a dive into the pool.